This dialog box lists all the revisions of the document being selected in the "Browse Files" tool. Revisions are ordered from most recent (top of the list; bigger revision numbers) to least recent (bottom of the list; smaller revision numbers). An item of the list contains the following information: the number of the revision, its creation date, the name of the user who created it, its file size. The "Open Selected Revisions" and "Compare Two Revisions" buttons will always be disabled (“grayed”) when selected file cannot be opened in XXE. This happens for example for files having a .html extension which are considered to contain plain HTML (text/html) rather than XHTML (application/xhtml+xml). When you know that files having a given extension actually contain XML, you may instruct XXE to open such files by using Options → Preferences, Tools|Helper Applications. 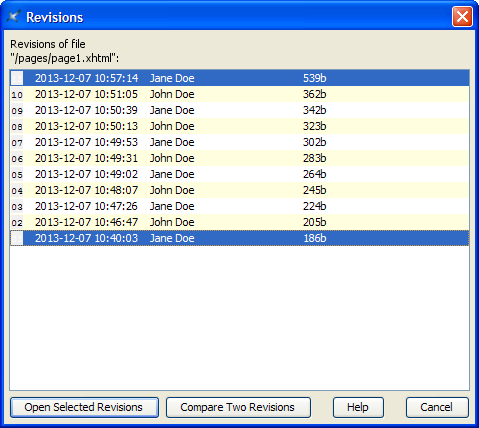 As expected, the settings will also have an effect on the "Open Selected Revisions" and "Compare Two Revisions" buttons. May be used to open in XXE one or more revisions selected from the list. The most recent revision is opened normally, in read-write mode. Older revisions are opened in read-only mode. Using File → Save As on a document opened in read-only mode will cause it to switch to the normal read-write mode. This precisely how you can revert to an old revision of a document. Example: saving "/pages/page1.xhtml 1" (which identifies revision #1 of file "/pages/page1.xhtml") as "/pages/page1.xhtml" will cause this document to revert to its initial revision. this button will display an alert dialog box when the comparison of revisions has not been enabled for the document being selected in the "Browse Files" tool.